Today’s news frequently mentions the American Woman who serves her country in uniform. How did she choose a military career? Where has her career taken her? What is she like as a person? Captain Aileen Marty MD, US Navy (retired), UN Weapons Inspector, Professor, Grandmother. Born in Havana, Cuba, Aileen’s family roots on the island date back to the early 1500s. Her large family enjoyed a gracious lifestyle there for generations. Shortly after Castro’s revolutionary forces seized control of the country in 1959, Aileen’s family was forced to flee. At the time Aileen’s father Frank was a young husband and father who worked in a Havana branch of an international bank. As people sought to leave the island, Frank was secretly helping them transfer their money to bank branches outside Cuba. When his activities came to the attention of the revolutionary regime he was marked for arrest and execution. With 15 minutes notice, Frank disappeared from the bank one lunchtime, and after several grueling months resurfaced in Venezuela, when he was able to send for his family. One day in 1961 Aileen’s mother Judy dressed her three little girls in their party dresses and boarded a ship to Venezuela. Aileen, four years old at the time, recalls ‘running all around the ship, having a great time.’ Eventually Judy’s parents joined them in Venezuela and later the whole family emigrated to the United States. With very little left of the life they had in Cuba, they had to start all over again. Commissioned as an ensign, Aileen received her medical degree in 1982 at the Miller School of Medicine at the University of Miami. Her early years in the Navy Medical Corps brought her to Pensacola to train as a flight surgeon, and then to the Washington Navy Yard where she spent a year in general medicine. During this time, she counted among her patients retired Admiral Hyman Rickover, father of the US nuclear fleet. Eventually Aileen settled on a career in pathology, followed by a fellowship in infectious disease. Upon completion of her training, Aileen traveled widely, stationed on naval bases in Puerto Rico and Spain, then later working in numerous Latin American and African countries, including Ghana, Togo, Côte d’Ivoire, Equatorial Guinea, Nigeria, and Kenya. Because of her early training in general medicine, Aileen also cared for patients as well as running pathology labs in these various countries. By the mid-1990s Aileen had been promoted to the rank of Commander and was Chief of Infectious Disease at the Armed Forces Institute of Pathology. She explains that with the fall of the USSR and the Gulf War, the US became increasingly aware of the threat of biological weapons from both Soviet defectors and military operations in Iraq. Suddenly Aileen’s field of infectious disease had become a national security issue. As a pathologist, her expertise in diagnostic testing led her into the field of environmental detection of biological weapons. Her deep knowledge in this area brought her to teach a graduate course in biological weapons at the military medical school, the Uniformed Services University of the Health Sciences in Bethesda, Maryland. Here Aileen trained dozens of government officials, both military and civilian, in the emerging field of biological threats and how to counter them. Another chapter to Aileen’s career arose from this course she taught when a group of her students submitted her name as a candidate for Weapons Inspector with the United Nations Monitoring, Verification, and Inspection Commission (UNMOVIC). Aileen explains that as an UNMOVIC inspector she received training in weapons and delivery technologies, dual use facilities, psychology, and cultural aspects of interviewing. She has deployed with UNMOVIC to countries all over the world. We marvel at the energy, commitment, and courage Aileen has shown in her professional life. In her large, close-knit family she has also been a devoted granddaughter, daughter, sister, cousin, aunt, wife, and mother of two wonderful children, Paul and Alina. Perhaps the greatest challenge Aileen has had to meet was the loss of her son Paul. He was killed in an accident at age 16 while a passenger in a car. We mourn with Aileen and marvel even more at her resiliency and strength in the aftermath of such a loss. In 2003 Aileen retired from the Navy, however by no means has she retired from public service. Firstly, she explains, she remains available to the US military as a retired officer. She has been called back to duty twice, most recently in the response to the 2014 West Africa Ebola crisis, the most widespread outbreak of this disease in history. Aileen visited the White House when the team she served on was recognized by President Obama. Today Aileen is back in her hometown of Miami. She is a professor at Florida International University where she teaches medical students, graduate students, and undergraduates. An internationally recognized expert in her field, she travels widely to lecture and serve on advisory boards. She is also a member of the state of Florida’s FAST team, an emergency response unit that deploys in hurricanes and other natural disasters. Aileen tells us her team can set up an instant Intensive Care Unit in 58 minutes. In 2015 Aileen was honored by her alma mater when she was inducted into the University of Miami Hall of Fame. A visit with this remarkable lady is also a chance to get to know Miami. Go with Aileen to the Cuban restaurant owned by her friend Gloria Estefan (Aileen knows EVERYONE). Listen as she switches easily between a discussion in English about the latest in biological weapons detection and a lengthy order in Spanish for exactly the appetizers she wants her guests to enjoy. This is a lady who is serious about hospitality. Go with her to the rooftop of her Miami Beach hi-rise and take in the breathtaking view of her hometown. 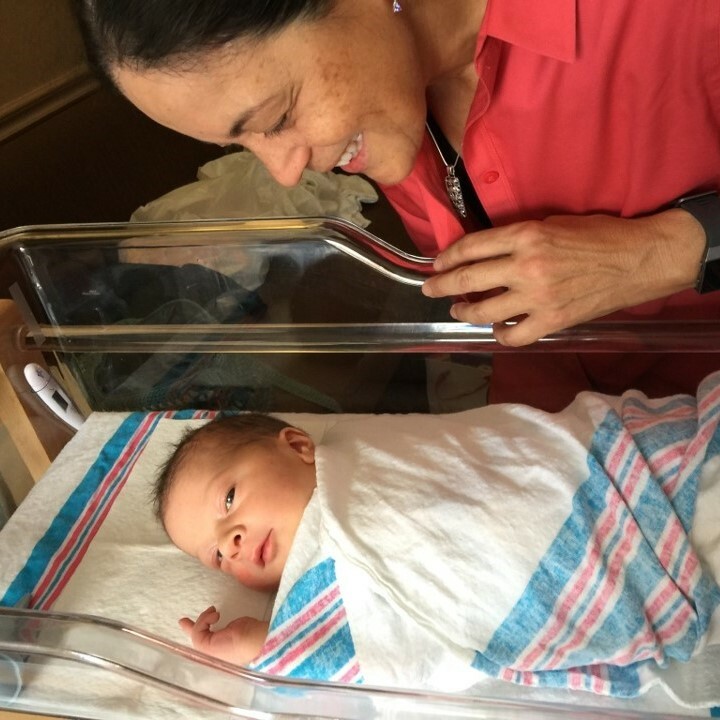 This summer Aileen added one more credential to her impressive list of accomplishments when she became a grandmother. In July, her daughter Alina and her husband welcomed baby Leo to the family. We congratulate and celebrate with this astonishing American Woman. Posted on March 31, 2019 by anikka becker.